Some have speculated that the BYU-Utah rivalry would fizzle out after Utah joined the PAC-12 and BYU went Independent in football. Will the Utes strike back? Long live the BYU-Utah rivalry! Even as a Utah fan, I think we are classless. I’m embarrassed for our organization, especially our proneness to bring on drunken fools that get kicked out of other schools for DUI’s, Marijuana, and general low IQ issues. Jordan Wynn would be good in the NFL Lingerie league……….. Personally, I don’t care for either team. I prefer water sports, that require men to wear speedos. A lot easier on the eyes. I didn’t leave that comment. Some sucker hijacked my account. If you even entertain the idea that BYU is better than Utah, you don’t know your history. 20 more wins??? yeah thats proof enough. Utah just feels bad for BYU. It’s kind of like beating up your younger less successful brother year after year…it just gets old, so you have to let him compete sometimes! Especially now that Utah is in the Pac12…we’ve already made them look desperate by forcing them to go independent and settle for the Armed Forces Bowl year after year. It’s just sad but we’ll keep the rivalry going to give BYU a chance to call their season successful, i.e. beating Utah. wow. Looks like Kevin Nelson is hijacking everyone’s account. First Levi, now me. Not cool. You are stealing intellectual property Kevin. Brock wants to meet with you in his office, ASAP. My vote is for the Utes. I ABSOLUTELY LOOOOVE THIS POST AND THE VIDEO OF ALEX PULLING UP TO SEE HIS SHINY BLACK JAG COVERED IN BYU STICKERS!!!!!!!! Oooooooh man Alex, I am sorry about that, you had to bite the bullet bad on that one!!! I LOOOVE BYU, I actually flew out to Austin last week for the Longhorns BYU game. 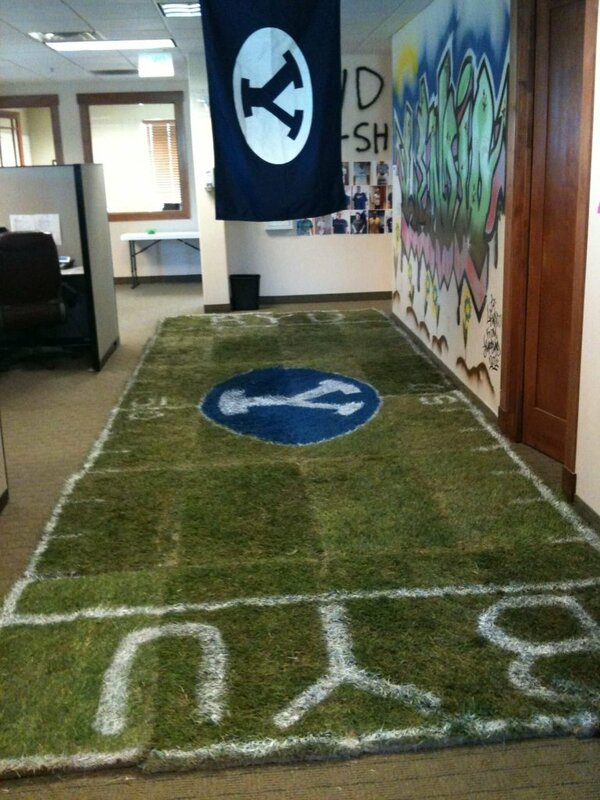 But seriously of all BYU vs. Utah office pranks I have come across, that one takes the cake!!! Alex – hahahaha yes painting his office and COVERING it TOP TO BOTTOM was HILARIOUS!!! One of the best pranks (pushing things to the limit) I have ever seen!!! We were here at work all talking about how awesome of a prank that was. I would love to see a video of Brock’s reaction when he came in and saw his Cougar blue office Ute red!! Hehehe….I have a feeling this is going to be good! I’m more pissed that BYU’s average ACT score for new students is double that of Utah’s. Were smarter!